! EVT Prime Colours ! 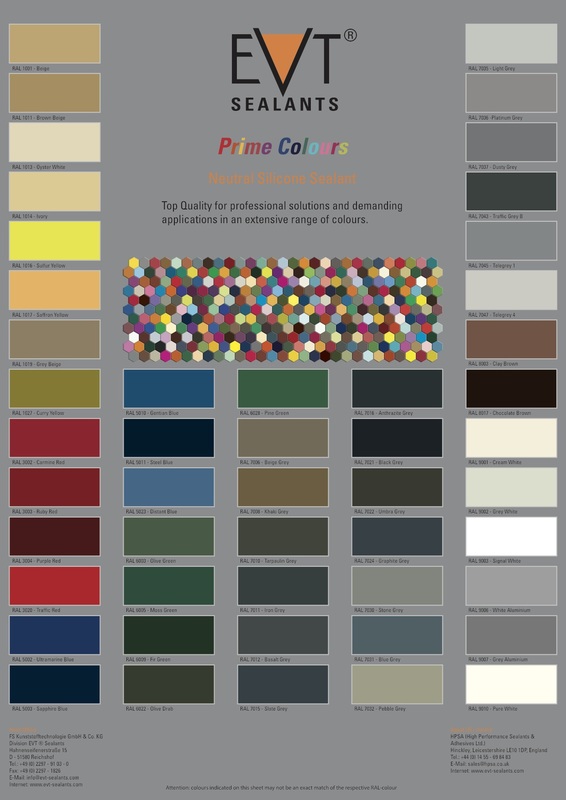 Welcome to our EVT Prime Colours blog page, if you want to see all of our colours on one page then simply click on the picture to the left and this will direct you to a page with all the colours we have available in stock. If the colour you are looking for is not listed then simply call us on 01254 265642 or email us at Info@abnbp.com as we can get any RAL made to order, minimum order quantities will apply. If you already know what colour you would like then simply click the picture to the right and this will direct you to the order page with a drop down menu so you can select your colour faster, if you do not see the colour you are after then please call or email us to order it in. In the world of mathematics, prime numbers are especially interesting. When it comes to shopping, the word ‘prime’ (from a root word meaning ‘first’) usually denotes the product that we are buying is the best of it’s kind (think prime steak!). With EVT Prime Colours, a RAL-Coloured Silicone, you get BOTH of these: the most interesting and the best coloured silicone around! EVT Prime Colours is a quality silicone sealant that creates a permanent, elastic, non-ageing seal between almost any two surfaces. As it cures in reaction to contact with moisture, this sealant cures quickly and is extremely durable once complete. The biocide-enhanced formula is easily applied with a dispensing gun (either air-, battery- or good old hand-powered) and can then be smoothed to perfection before surface-finishing agent is applied. Construction joints of most surfaces can be successfully sealed using EVT Prime Colours and typical uses include sealing concrete, plaster and coated wood areas. The formula is perfect for sealing uPVC window and door frames and can even be used with some metals and for sanitary applications, whether outside or in. Tell me about the colours! We have uploaded 57 of most bought RAL colour choices for EVT Prime Colours silicone sealant and you can start enjoying the rainbow right away. We are conscious, however, that colour is an intensely personal decision and there are a hundred shades of every tone: don’t worry, as we have many more colours available (the entire RAL spectrum!) and our experts can help you find the perfect shade for your intended application. Carmine Red: Perhaps it is the dark nights and the chill of impending winter in the air, but this bright, warm and engaging red has our name written all over it! Anthracite Grey: You might think that there isn’t really much scope when it comes to grey but you would be very wrong. In fact, there are many shades of grey (fifty? Maybe you can count them…) but Anthracite is our favourite as it really comes alive in sunlight when it gives off undertones of blue and green. Mahogany Brown: This is a warm and woody colour that grabs attention. It's an essential colour of nature that symbolizes ease and contentment.